With its sleek look and low profile, the Wireless Ergonomic Ambidextrous Mouse offers style and substance in one package. You’ll find all of the support you need to power your way through the day. Even better: the new version of our Ambidextrous Mouse is completely wireless, so you won’t be tethered to a USB port that’s far away from where you’d actually like to mouse. And with total plug and play technology and a long-lasting battery (two months with one AA battery, four months with two), you’ll be set up instantly and for many months to come. 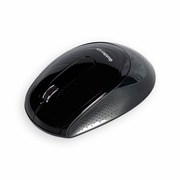 The Wireless Ergonomic Ambidextrous Mouse offers a high degree of precision thanks to its 1,000 DPI optical sensor. It also offers an anti-slip side and base grips to ensure maximum steadiness as you move across your desk. And with easy click buttons and a scroll wheel always within reach, you’ll navigate easily without straining your wrists, hands, or forearm. Long Lasting: Functions with one or two AA batteries. Estimated battery life is two months for use with one AA battery, and four months for use with two AA batteries. Plug-and-Play: No lengthy installs here: just plug in the Wireless USB 2.4 Gh receiver and you’re good to go.